I am Mary Ayaba. I was born in 1989 at Gambaga in Northern Region to Mr. and Mrs. Ayaba. I have two brothers: Peter and Noah. I had my basic education at the Presbyterian Primary and Junior High Schools in Gambaga. I continued my secondary education at Nalerigu Senior High (NASS) as a General Arts student. Life after Senior High School turned very difficult for me. My father died prematurely, which brought a lot of problems to me and my siblings. In 2008, I left Northern Region and went down south in search for a better life. By the grace of the Merciful God, I had admission into Global Professional Studies to pursue a course in Health and Safety Management. Since childhood, I have had the desire to be a health educator. In 2013, I got the chance to be trained as a first aid trainer. I did my one year national service at the Ghana Red Cross Society in Bolgatanga. There I was a team leader and trained drivers on first aid and emergency procedures. After the national service, life got tough again. Finding work was hard to come by and depended on who you know. I was very happy to be employed as a teaching assistant at PAMBE Ghana La’angum Learning Centre. I am very grateful for the opportunity to be a teacher and a student as well. 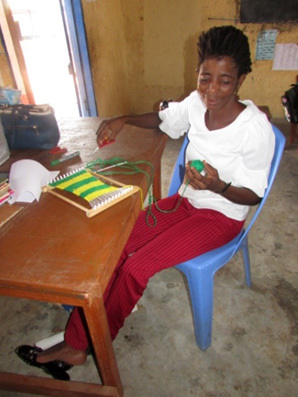 I am learning a lot at La’angum Learning Centre, and it is making who Mary Ayaba is today and will be tomorrow.